Hi, my name is Molly! I was found as a stray and was brought into rescue after a Facebook campaign drew attention to me and found me a foster home - I am lucky to have been rescued and nursed back to health! I got to attend Petsmart's National Adoption Weekend last month - it was so much fun getting to meet everyone and sharing my story. I loved getting lots of pets and making new friends. So...a little about me - I'm petite, pretty and white! I've gained about 10 lbs since coming into rescue in October of 2018 and am finally at the perfect weight of about 65 lbs. I am about 9 years old, but don't let that fool you because I'm still full of energy! I'm a really lovable girl who leans in for pets and snuggles whenever I can! I'm a really happy girl who loves people, belly rubs, and my foster brothers and sister. 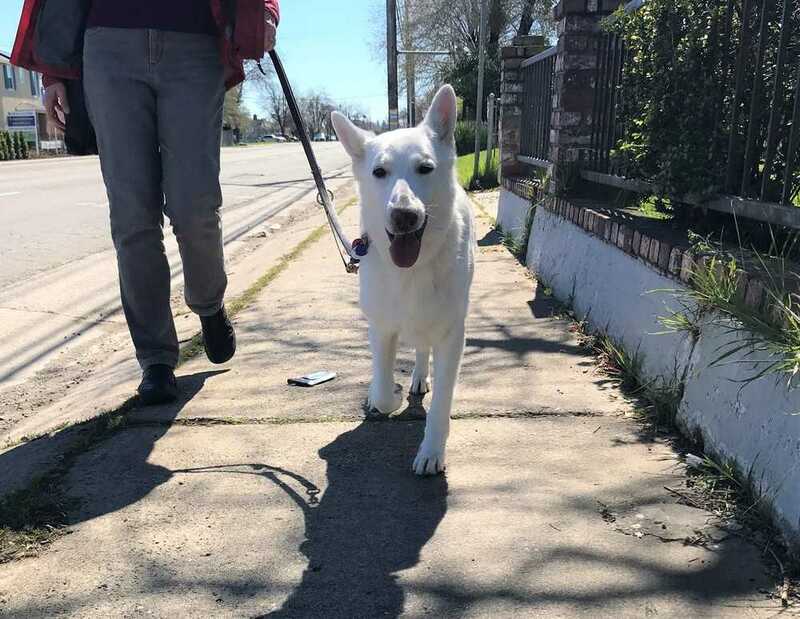 I also really love, love, love going on walks, and I think I would also make a good jogging or running companion (for short distances) because I hardly ever stop to sniff or relieve myself along the way - I just like to go! Check out the video of one of my morning walks with my foster brothers and sister at https://youtu.be/h5jKH-cyqZI. You'll be able to see how much my bum has improved from those days with my current park video. I'm really easy going - I sleep through the night and when I wake up, I'm ready for breakfast and then a good walk or run. At home, I enjoy lots of attention and love and will often nudge your hand or leg to ask for more. And don't forget my belly rubs! I'm a really good girl who doesn't have to be crated during the day, so I enjoy snoozing on my favorite bed while my foster mom and dad are at work. I would do best with someone who knows a little about my breed and I could use a refresher course in basic obedience since I really pull hard on the leash! My foster mom and dad tell me I can't be any cuter, and I hope after reading this and looking at my pictures, you think I could be the perfect fit for you and your family! Level 3 - Standard Adult Dog. Moderate energy adult dog, needs daily exercise to thrive and stay happy. Adopters must have prior, recent large breed experience as these dogs may have minor behavioral issues or need training.